April sees commemorations across the globe of the initial landings in a campaign centred on the Dardanelles Strait and the Gallipoli Peninsula in Turkey. For Turkey, Australia and New Zealand this campaign has a very strong connection with their national identities, with the emergence of Mustafa Kemal (later Ataturk) as a prominent commander among the defending forces and the birth of the ‘Anzac tradition’ (Anzac being the Australian and New Zealand Army Corps). 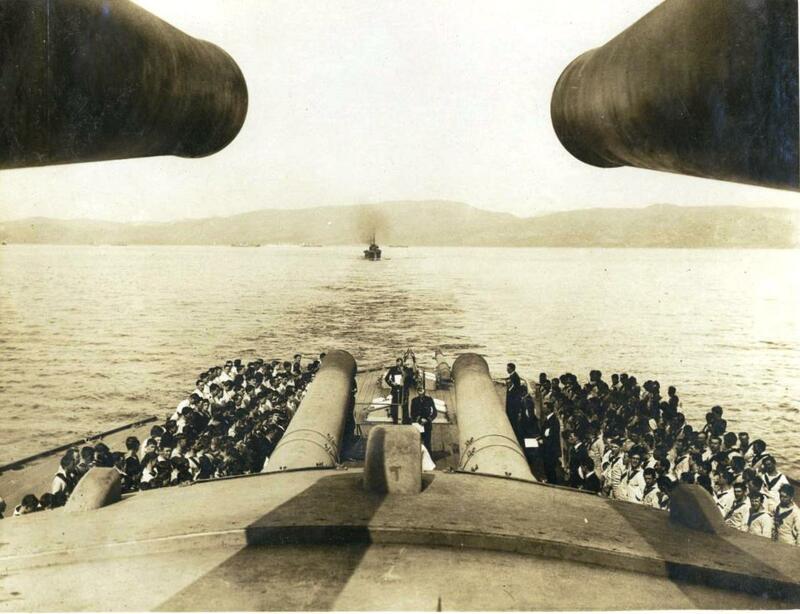 Church service onboard the Royal Navy battleship, HMS Queen Elizabeth during the Gallipoli campaign. Admiral Library, Portsmouth, Ref Ca 1062. While these are central elements of the campaign they also need to be seen in the context of what, on both sides, was a wider imperial conflict. Many of the defenders of Gallipoli came from throughout the Ottoman Empire, which then controlled much of the Middle East. Also, the attacking forces came from across the British and French Empires, with British and French troops making up the largest part of the Entente land forces and suffering the majority of the casualties. Troops came from as far apart as Senegal and Newfoundland (which was not yet part of Canada) and Indian and Gurkha troops suffered some of the highest casualties in proportion to their numbers. The campaign was not just fought ashore but at sea. Key contributions came from the Royal Navy, France’s Marine Nationale and the three-year-old Royal Australian Navy. In the air, contributions came from the Royal Naval Air Service and later French, Ottoman and German planes. All these elements give Gallipoli a further significance as the precursor of the modern ‘Joint’ (different armed services co-operating together closely) and ‘Combined’ (different countries working together in intimate partnership) operations of today. One aspect of the eleven month campaign (February 1915 to January 1916) which was clearly found to be inadequate was British decision making at the strategic level. Prime Minister Herbert Asquith had formed a War Council which included Winston Churchill as First Lord of the Admiralty. Churchill relentlessly sought innovative ways of prosecuting the war beyond solely reinforcing the British Army on the Western Front and he was an important, but not the only, supporter of the Dardanelles campaign. Though some of the proposed benefits of success, such as a new ‘Balkan Front’, were hugely optimistic, the opening of a reliable supply line to Russia was a legitimate goal worth significant risk. What was lacking was the capacity and the assessment of the benefits and risks of the attack at Gallipoli. Also lacking was the means to then explicitly challenge Asquith’s government over whether Britain had the capacity to support two major campaigns (Gallipoli and the Western Front) in 1915. This sort of scrutiny would have improved the odds of better decision making, but would not have guaranteed it. Historical assessment now stresses the highly unlikely chance of success in the campaign, particularly as time progressed, but this is much clearer in retrospect than it was at the time. The impressive resilience of the Ottoman defenders masked the fact their military performance in most preceding conflicts, and the earlier stages of the First World War, had frequently been poor. The Entente forces were planning on an Ottoman psychological collapse that was based partly on prejudice but also on some evidence. Then and now the psychological element of conflict remains the most difficult to assess and predict. By the later stages of the campaign improvements had begun to emerge in decision making and also in specialised shipping, logistics and military co-operation. This came too late for the Gallipoli campaign itself. The benefits would be felt later as an example studied across the world by students such as the future US General George S Patton and the knowledge gained would feed into preparations for later conflicts such as D-Day, the Falklands and beyond. Stephen Prince is Head of the Naval Historical Branch in the Ministry of Defence. He has previously been a Sir Robert Menzies Scholar at the Australian War Memorial, a lecturer at Britannia Royal Naval College and a senior lecturer at the Joint Services Command and Staff College. It was a strategic and tactical disaster that should never have happened. A relic of the "send a gunboat" mentality that pervaded Victorian England and the empire. Yes, an utter disaster. So easy for someone in Churchill's high position to make a decision with poor intel and also incorrect British Empire supremacy feeling. The sufferers of the wrong decision were of course the 10's of thousands of military personnel who perished. Would it have happened if the King led the attack, as in Agincourt? Churchill clearly didn't learn from history and once again as First Lord of the Admiralty embarked on the ill-fated Narvik Campaign in 1940 from which we had to withdraw after the retreat from Dunkirk. These actions were raised as to whether Churchill was the right person to lead the country after Chamberlain's resignation after Dunkirk. Back in 1971 I used to work with an old chap who served in inteligence at Galipoli. His translator went on to become president of Cyprus and every year received an impressive Christmas card from him. He told me many fascinating stories about the camapaign as he went there as a soldier, promoted sergeant and quickly became an officer when a shell hit regimental mess tent and wiped out most of the NCOs and officers.